One morning, I was invited to a chicken processing, i.e. slottering, by a new friend who was raising some chicken for private use. 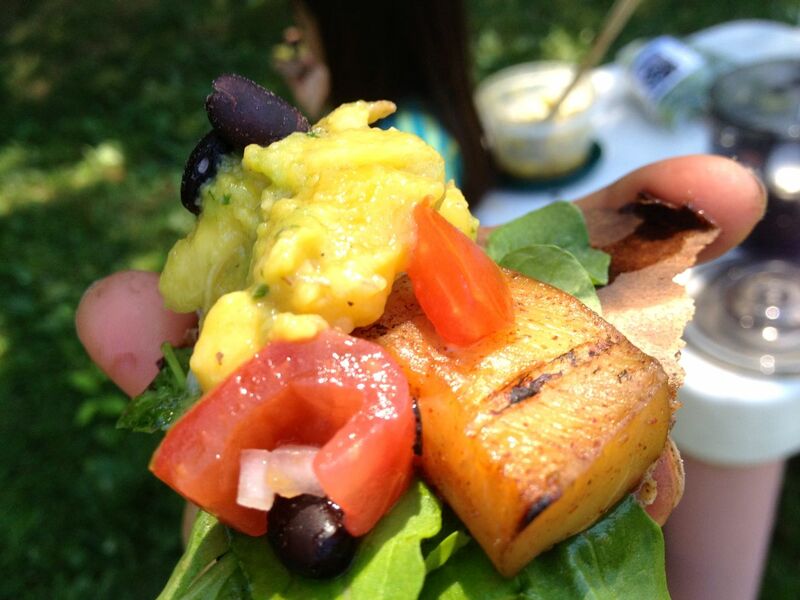 I already had plans to go to my favorite Bikram yoga class that morning at Martha’s Vineyard Yoga, in West Tisbury. I love that class. It totally focuses, relaxes, and challenges me. I couldn’t decide if I wanted to slaughter chickens or do yoga. I had an unusual moment of clarity, and my decision came to me easily, like this: if I went to yoga, I knew I’d be thinking about the experience I was missing, processing chickens on a beautiful farm, with some cool, knowledgable people. A yoga instructor I know recently said, stop trying to control life all the time. Let life “do you”. So I dropped my plans for yoga that day, and rushed over to the farm. I was just in time. 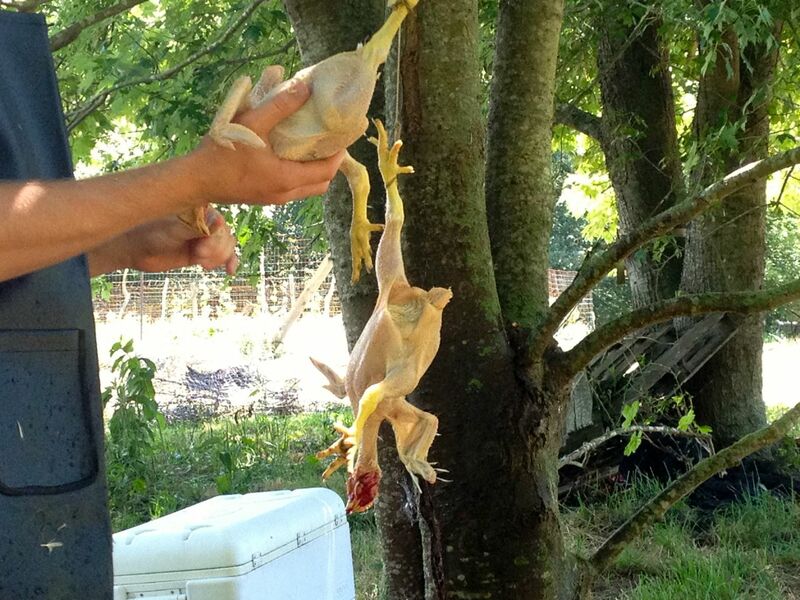 The first processed chickens were hanging by string from a tree, where Rebecca and Kevin plucked off their feathers by hand. I stepped right up and into the action. Kevin cut, Rebecca and I de-feathered, and then eviscerated. 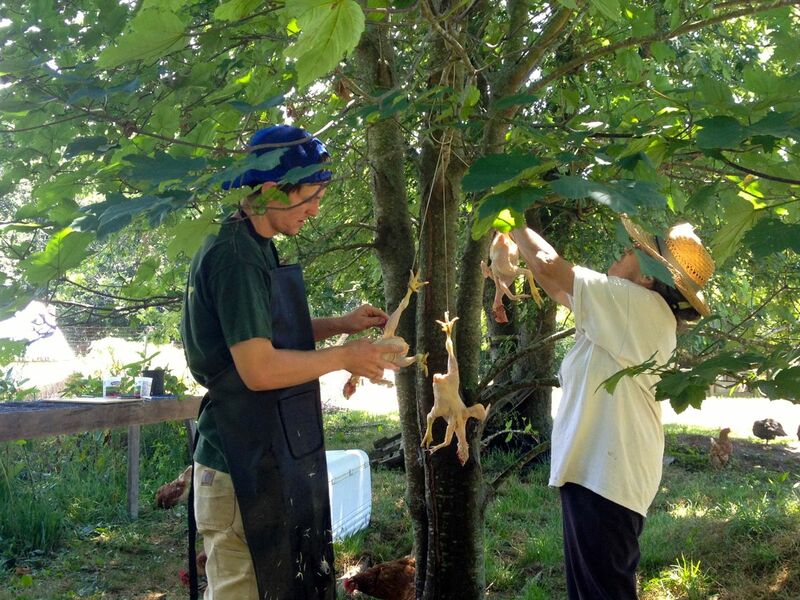 I learned this process at the Farm Institute, and though these were poussin chickens–young, 1.5 lb chickens– the basic steps were the same. The organs were much more tender, though, and I had to be careful not to squeeze the liver too much so it would stay nice and intact. I bet someone could make great paté with those young, clean livers! Right after the chickens are killed and drained of blood, they are plunged into a hot water bath to make the feathers easier to remove. (With larger chickens you can use a contraption that spins the chickens and takes off most of the feathers, but the skin of these four -week-old chickens was too tender–so we had to do it by hand). 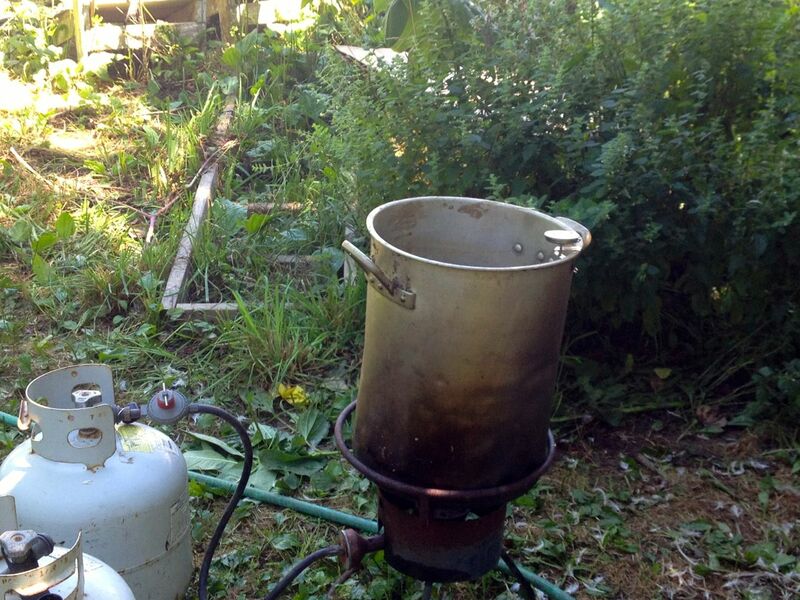 Kevin had to heat his pot of water over an open fire once the propane burner ran out of fluid. 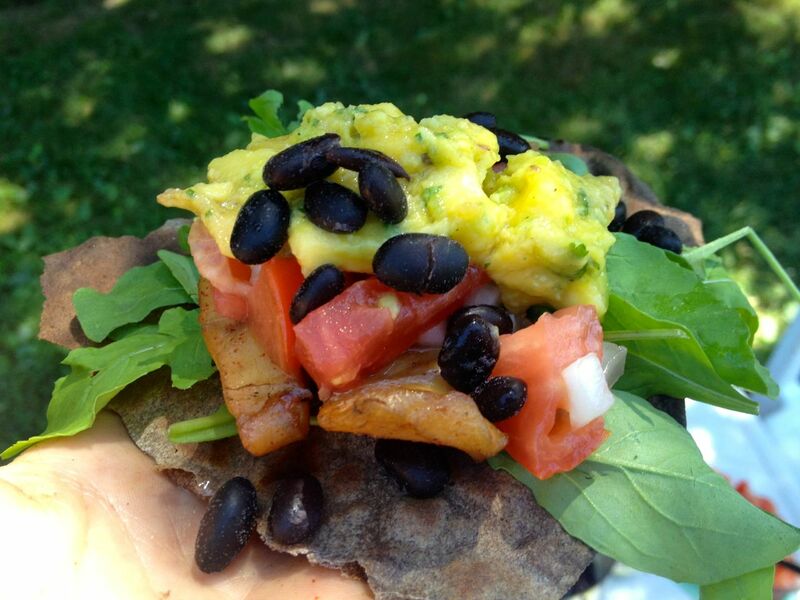 Later, over that same fire, I cooked fish tacos, with home-made buckwheat flour tortillas, spice-rubbed sea bass, black beans, mango and avocado salsa, as well as fresh tomato and onion salsa. And of course, a squeeze of fresh lime juice! 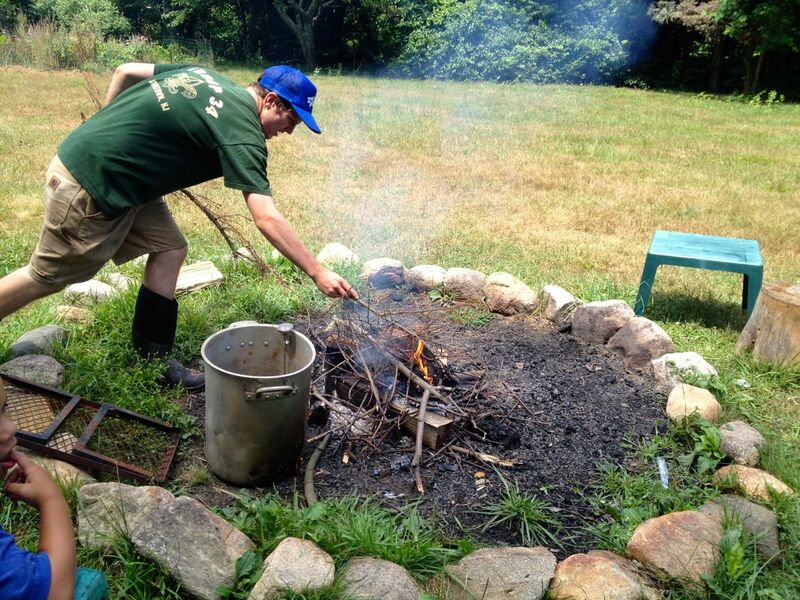 By the time I was ready to grill, the flame had died but there was plenty of heat and smoke. 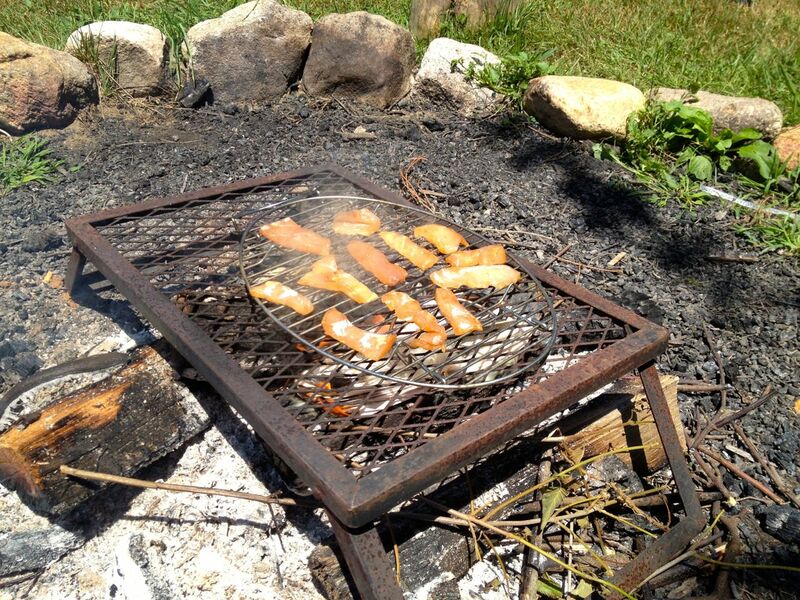 I ended up smoking the fish, so it developed a moist, slightly gummy texture, with a smokey sweet flavor. So far, in the three times I’ve processed chickens, I move slowly, much slower than others I’ve worked with who have done it a bunch of times. I feel like, although the chicken is dead, I want to respect it. I don’t want to squash the organs while removing them but make sure I gingerly take out fully intact. For culinary reasons (since the livers and hearts will be used) and out of respect for the chicken. 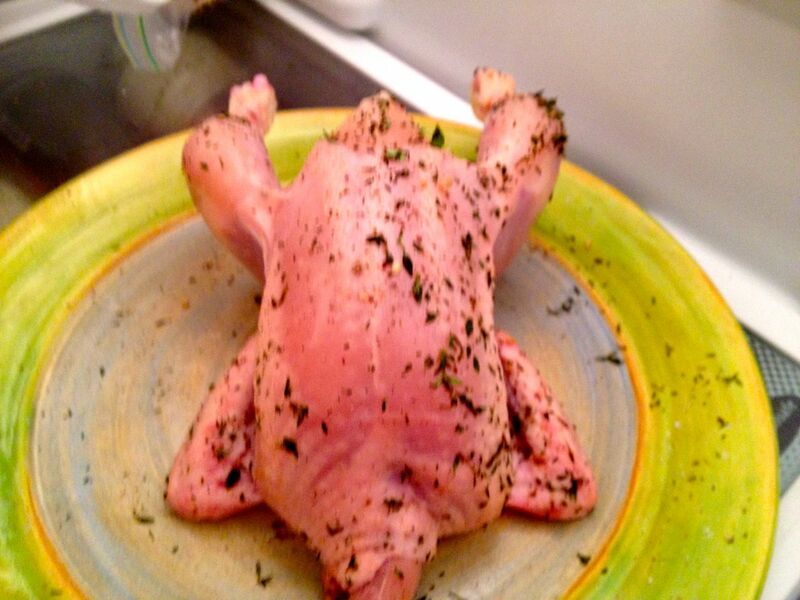 I was rewarded for my help with a poussin of my own! It is absorbing seasoning right now, just salt, pepper and thyme, in my fridge. Stay posted for the outcome! 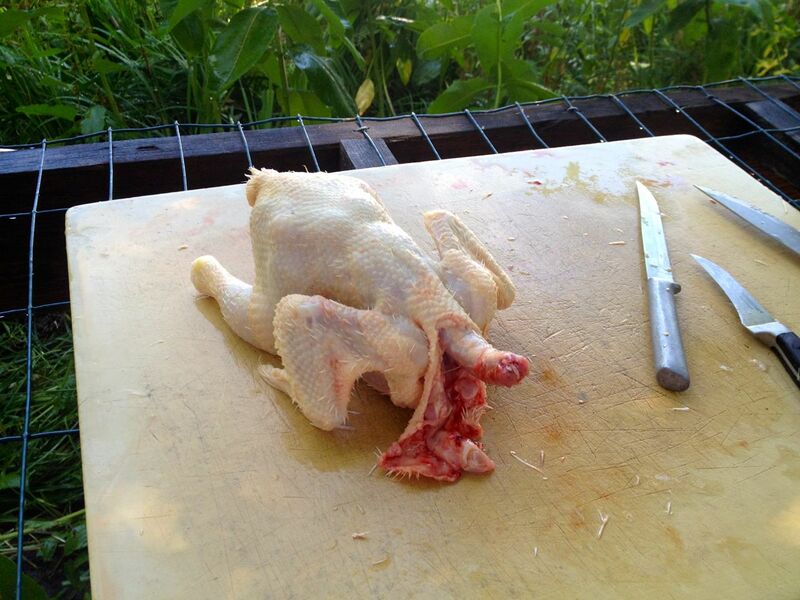 Not the most flattering view for this chicken Would look better with his legs tied in butcher twine!